The NACOR dashboard was unlocked on April 8. Practices may now edit their practice and provider lists. AQI recommends that practices review and update their provider lists prior to AQI's data warehouse transition July 1. Providers who have retired or left your practice prior to January 1, 2019 should have their status set to "removed" on the provider list. Setting providers to "remove" will not impact historical data. The 2019 MIPS, QCDR and Internal Improvement measures will not be available for review in the dashboard until the transition July 1. Practices can review the practice level data completeness report to confirm billing and measure/quality codes have been submitted for 2019. Data for December 2019 and any corrected files must be submitted by February 14, 2020. Practices are encouraged to upload data files prior to the deadline to allow time for review and to submit corrected files if any errors are identified. 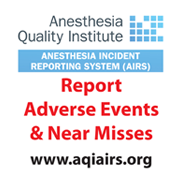 AQI recently released Internal Improvement Measures for reporting to the National Anesthesia Clinical Outcomes Registry (NACOR). The collection of 22 measures is intended for internal improvement purposes only and are optional for practices to report. Reporting these measures may aid a practice in benchmarking their performance, demonstrating their value and quality care to payers and facility administrations, or as part of practice and quality improvement initiatives. CMS has not recognized and will not accept these measures as part of an anesthesiologist's or practice's participation in the Merit-based Incentive Payment System (MIPS), or as part of an Advanced Alternative Payment Model (APM). AQI will not send data gathered on these measures to CMS. Read past issues of AQI's NACOR News. Question: If a provider has left the practice half way through the year - does the practice need to report the provider's cases? If the practice is reporting as a group and the provider performed cases in 2018, the practice needs to be reporting 60% of all eligible cases for that provider regardless if they are still at the practice or not as CMS is evaluating the data at the TIN level not the individual NPI. If the practice is individually reporting, the data will follow the provider's NPI. Question: In regards to the reporting year on the AQI website it state to submit 60% of eligible cases and we understand it is not pick your pace but does this mean 60% of 2018 cases? Can you elaborate? The 2018 MIPS reporting requirement is to report on 60% of the denominator eligible cases for 6 measures including 1 outcome measure for the 12 month reporting period (1/1/2018 - 12/31/18). For example, If your practice is reporting MIPS 76 - Prevention of Central Venous Catheter (CVC - Related Bloodstream Infections and places 75 central lines during 2018 your practice would need to report on 45 cases which is 60% of the eligible cases. Question: Is it possible for all providers in a practice to be non-MIPS eligible and not required to submit data as individuals, but are eligible as a group? Yes if the individual providers do not meet the 2018 MIPS participation criteria (billed $90,000 or less in Physician Fee Schedule (PFS) services furnished to Medicare Part B Fee-for-Service (FFS) beneficiaries (including Railroad Retirement Board and Medicare secondary Payer) and have 200 or fewer Medicare Part B FFS beneficiaries) the practice can be MIPS eligible as a group if the group has billed $90,000 or more in PFS services furnished to Medicare Part B beneficiaries and have 200 or more Medicare Part B beneficiaries.